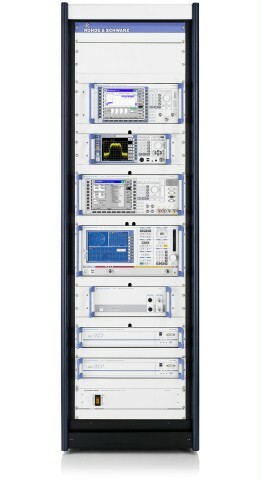 The R&S®TS8996 RSE test system is designed for EMI and radiated spurious emission tests on wireless devices. The test system is often combined with a semi-anechoic or fully-anechoic chamber. The high-sensitivity filters are contained in modular shielded units, eliminating the need for a shielded control-room. The R&S®TS8996 RSE test system is designed for EMI and radiated spurious emission tests on wireless devices. The test system is often combined with a semi-anechoic or fully-anechoic chamber. The high-sensitivity filters are contained in modular shielded units, eliminating the need for a shielded control-room. The R&S®TS8996 is applicable during R&D or for EMC type approval. Typical devices under test (DUTs) are mobile phones, cellular base stations, radio sets and other short-range devices. The relevant standards for these DUTs stipulate a wide range of test setups and a wide and high frequency range (up to 40 GHz). All tests according to these standards can be performed with the R&S®TS8996. The test system can be easily adapted to customer-specific requirements. For more detailed information please refer to the R&S®EMC32 data sheet. The complete software package runs on a PC or PC-compatible industrial controller. The system components are driven via the IEC/IEEE-bus interface. The relevant standards stipulate a wide variety of measurements in a very wide frequency range, all of which can be covered with R&S®TS8996 e.g. For some radiocommunication systems (eg short-range devices), higher frequency limits (eg 40 GHz) are already stipulated for spurious emission measurements. R&S®TS8996 can be easily adopted accordingly to accommodate the customer requirements. Spurious emission measurements differ from EMI measurements to EN55022 mainly in that bandwidths matching the useful signal have to be set on the receiver instead of the typical EMC bandwidths (eg 200 Hz, 9 kHz, 120 kHz). It should also be noted that EMC bandwidths are referred to the 6 dB points of the IF filters, whereas the bandwidths for spurious emission measurements are referred to the 3 dB points. In spurious emission measurements, the peak detector takes the place of the quasipeak detector. All these differences make it necessary that for spurious emission measurements a spectrum analyzer or test receiver with spectrum analyzer functionality be used rather than a pure EMC test receiver. Other technologies are available on request.